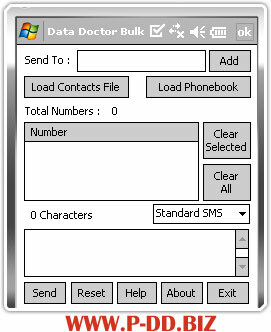 Specifically designed Pocket PC to Mobile Bulk SMS Software facilitates user to send unlimited text messages directly from Pocket PC to any phone number in easy way. Simple software working interface allows user to broadcast mass sms to individual or group of mobile phone users in short time. Mobile sms messaging utility is capable to send text messages at all national or international mobile phone networks without requiring any internet gateway. SMS sender application is highly beneficial for marketers who have to travel long for the business and find difficult to handle laptops. Software offers convenient and reliable way to communicate with bulk audience anywhere at any time. Instant text messaging utility is useful for alerting the users during any emergency need (like sudden meeting calls from office, any important news for family members etc) occurred at unusual time or informing customers about the latest products, offers, market news, price updation etc. Group sms sending software supports all major Pocket PC, PDA and Smart phones of popular brands like HP iPAQ, LG, Samsung, Hitachi, HTC, Palm Treo, Dell Auxim, Motorola, Nokia, Asus, Velocity, Gigabyte, Pantech, Siemens and many more. Sends bulk SMS instantly from Pocket PC, PDA mobiles to all cell phones. Support to national and international mobile phone networks. Facility to maintain contact lists containing unlimited phone numbers. No technical expertise needed to operate the program. Compatible with all windows based Pocket PC, PDA mobiles and Smart phones. Provide friendly GUI that enhances user interaction with the software.